The Duanwu Festival or better known as Dragon Boat Festival is just around the corner and it’s time for celebration! 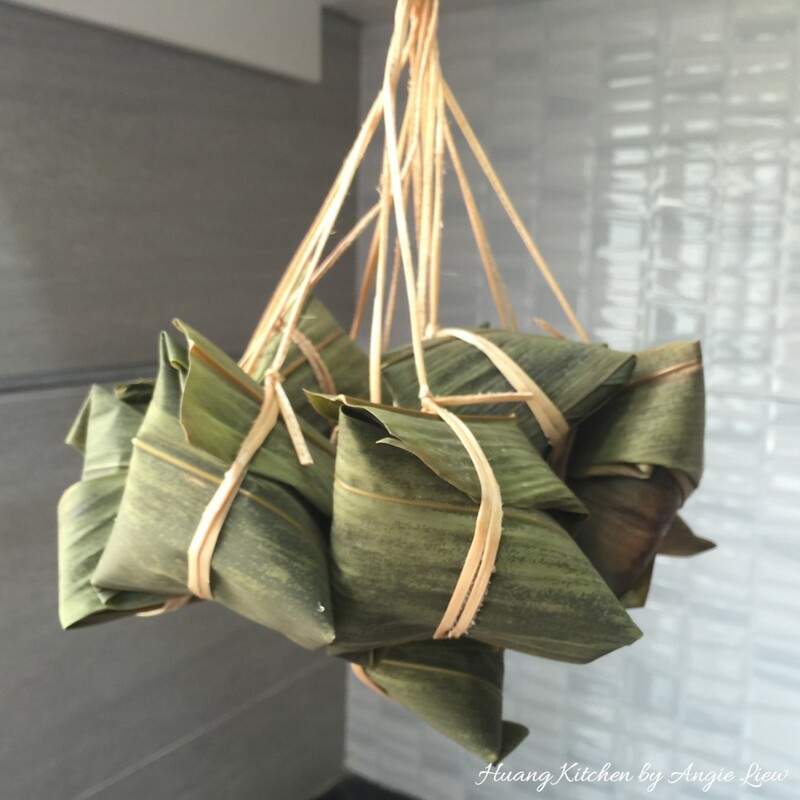 It is also a season of Zongzi or rice dumpling leaf fragrance. This festival falls on the 5th of May every year in the Chinese lunar calendar. 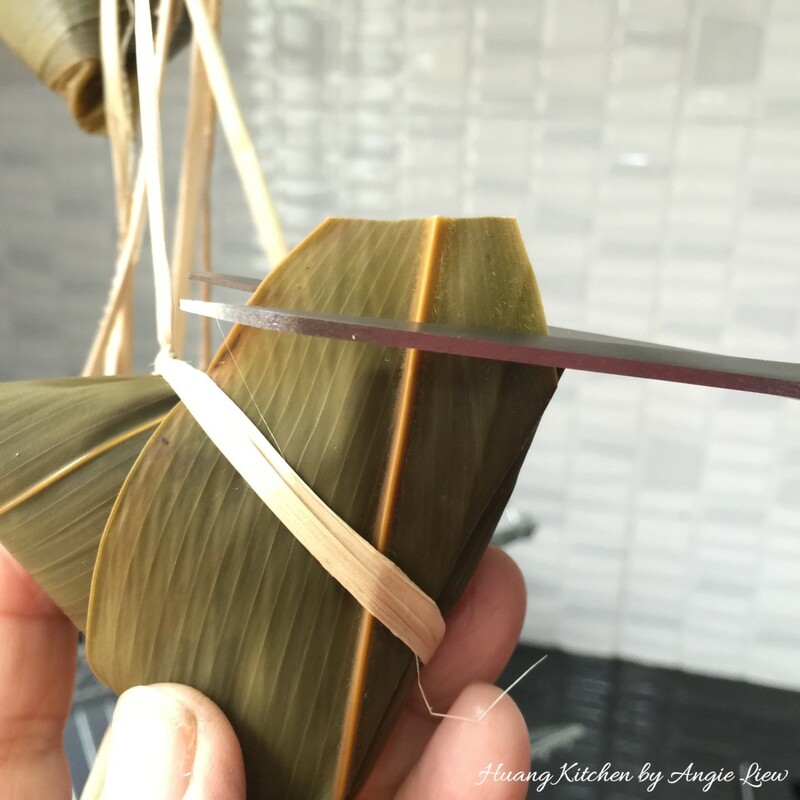 During this time, the Chinese celebrate by making and enjoying homemade or store bought pyramidal shape glutinous rice dumplings wrapped in delightful bamboo leaves. 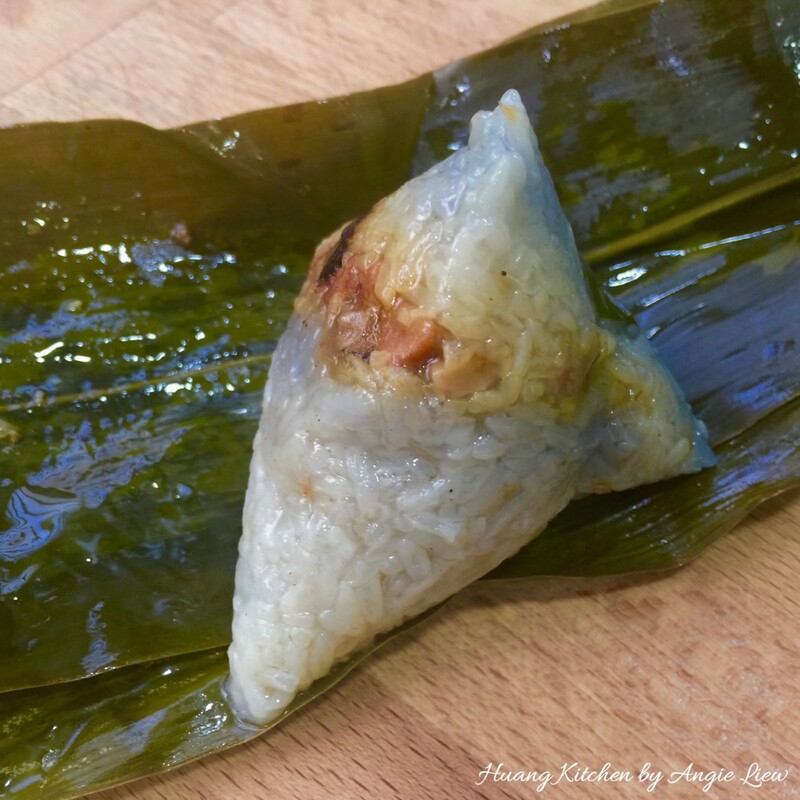 For this recipe, Nyonya Rice Dumplings with spiced chicken filling, is a peranakan style of rice dumplings. 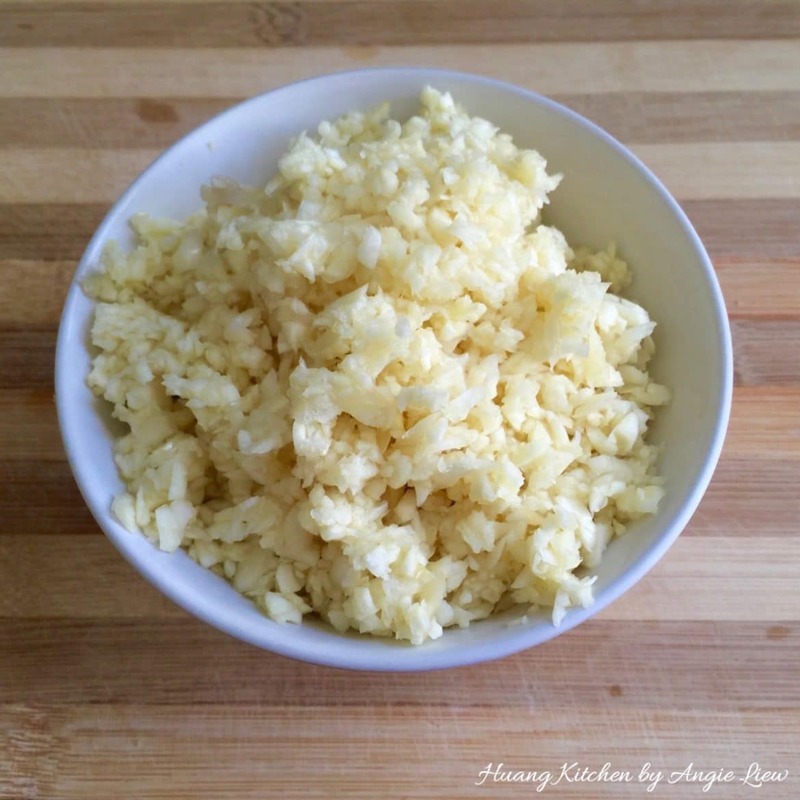 They are less oily as compared to the traditional rice dumplings and are easier to make too. They do not just taste GREAT, they are extremely appealing to the eyes too. 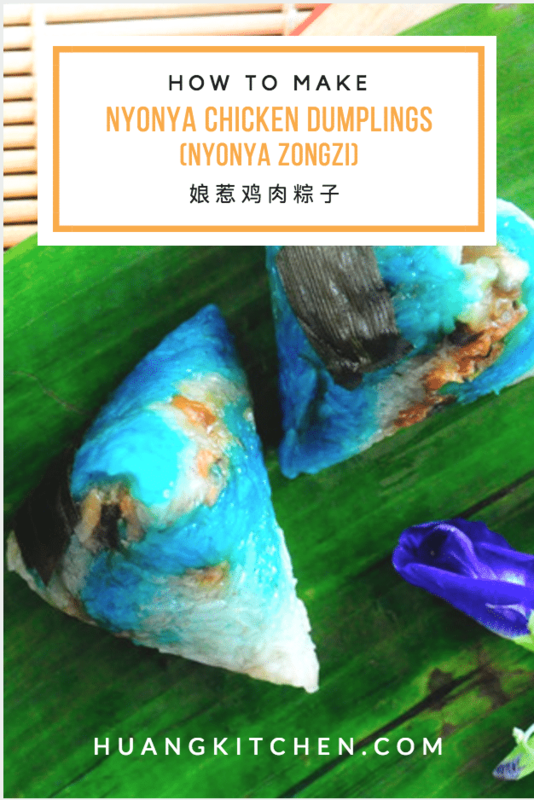 They are petite, pretty looking and has the signature blue colour, a result of the natural blue colouring from the butterfly pea flower. Taste wise, they are gooey, sweet as well as savoury and infused with the nice grassy aroma of the bamboo leaves and spiced chicken filling. 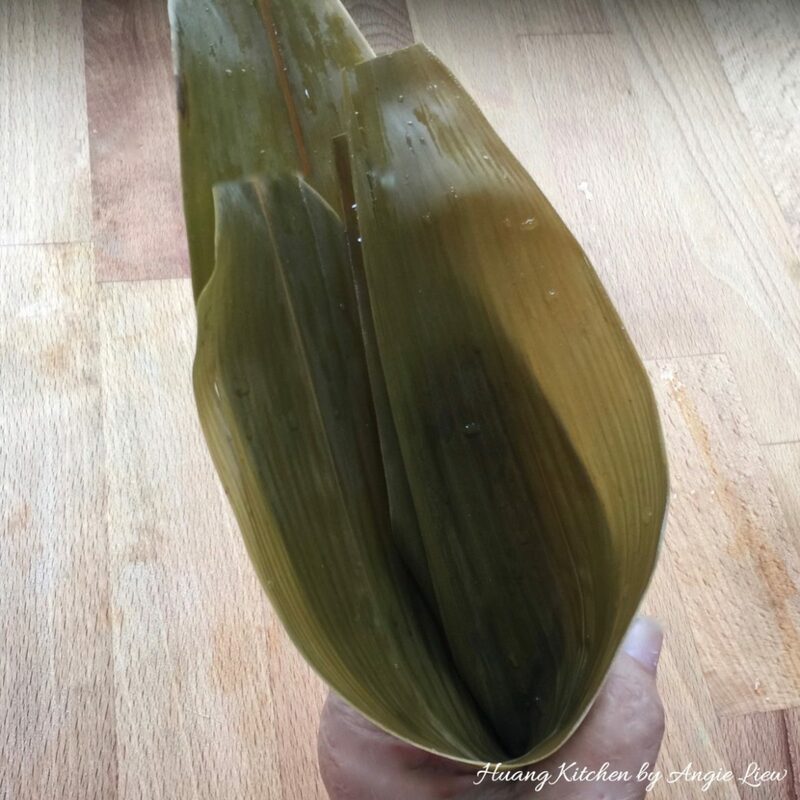 The fragrance from the pandan leaves and coriander powder really make a big difference too. So Enjoy and Happy Dumpling Making! 1kgglutinous ricedivide into 2 equal portions. 30gramblue pea flowersboiled in 200ml water. 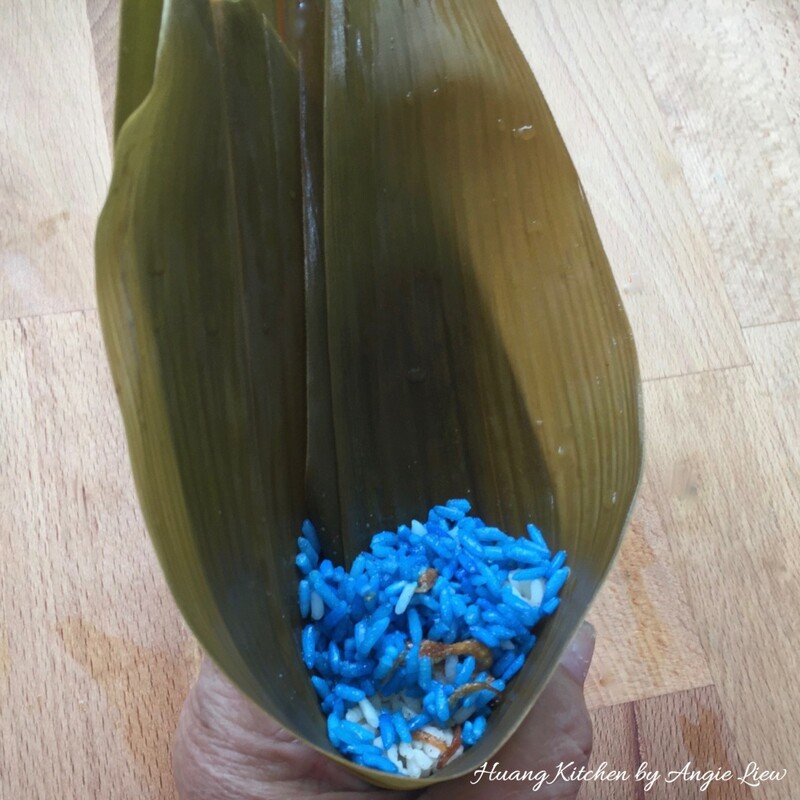 1tspwhite vinegarsoaked the blue coloured glutinous rice. 6piecesscrew pine leavescut into 2 inch pieces. 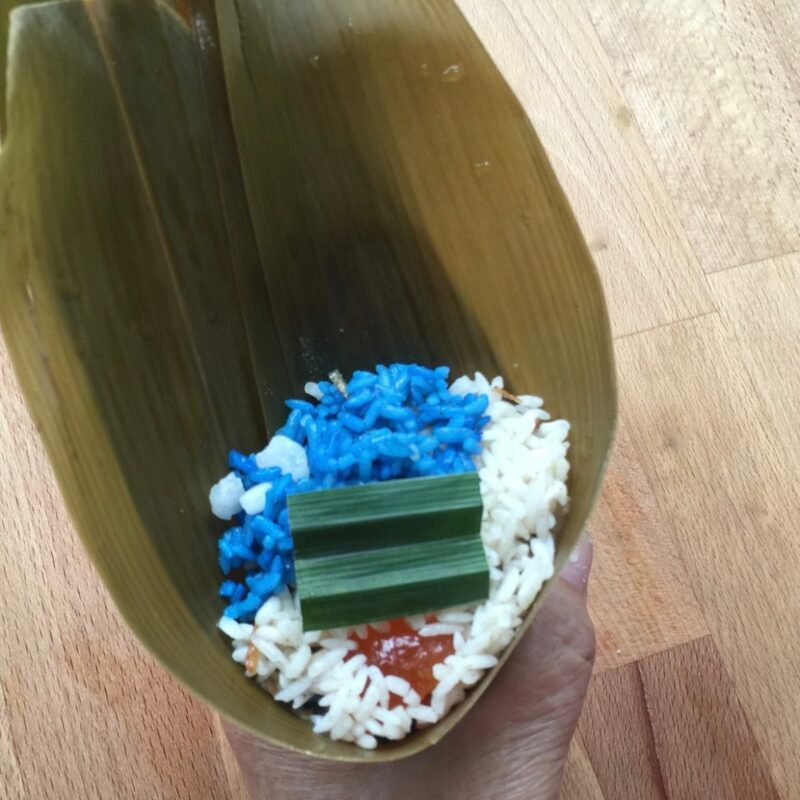 1tbspsalteach for white & blue colour glutinous rice. 1tbspground white peppereach for white & blue colour glutinous rice. 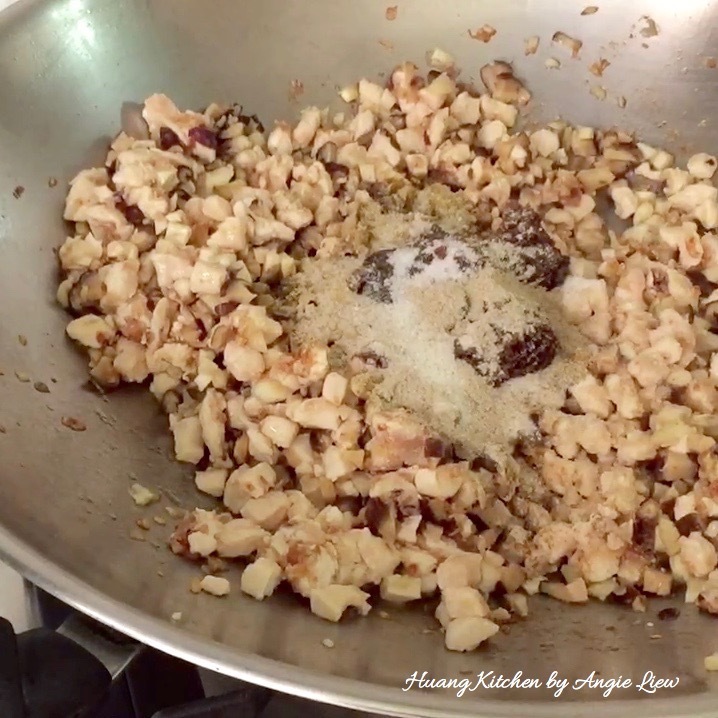 1tbspfried garlic oileach for white & blue colour glutinous rice. 50gramdried shiitake mushroomssoftened and cubed. 10salted egg yolkcut into small pieces. 250gramcandied winter melonchop into small pieces. 2tbspfermented bean pastealso known as taucho. 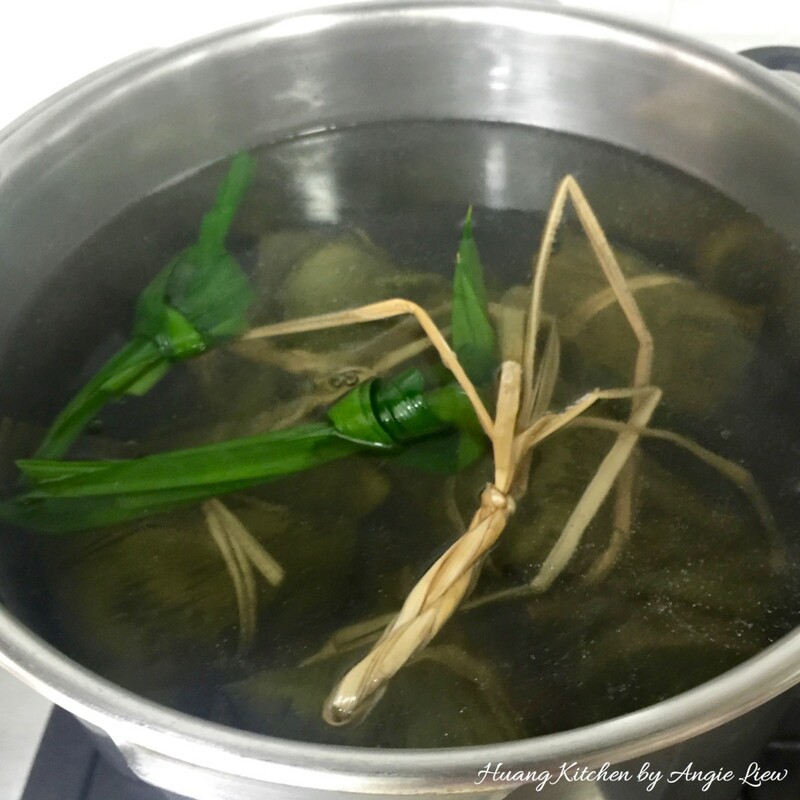 Soak bamboo leaves in a pot of boiling water until soft, about 15 minutes. Using a clean cloth, wipe each leave on both sides. Then leave to soak in clean cold water together with grass strands until needed. 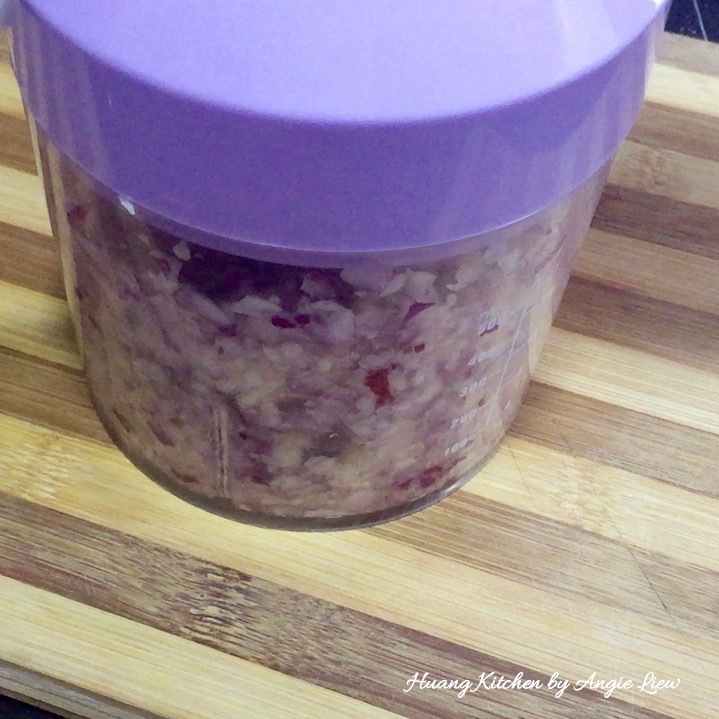 Chop some garlic to use for seasoning the glutinous rice. Then heat up oil and fry the chopped garlic till golden brown. 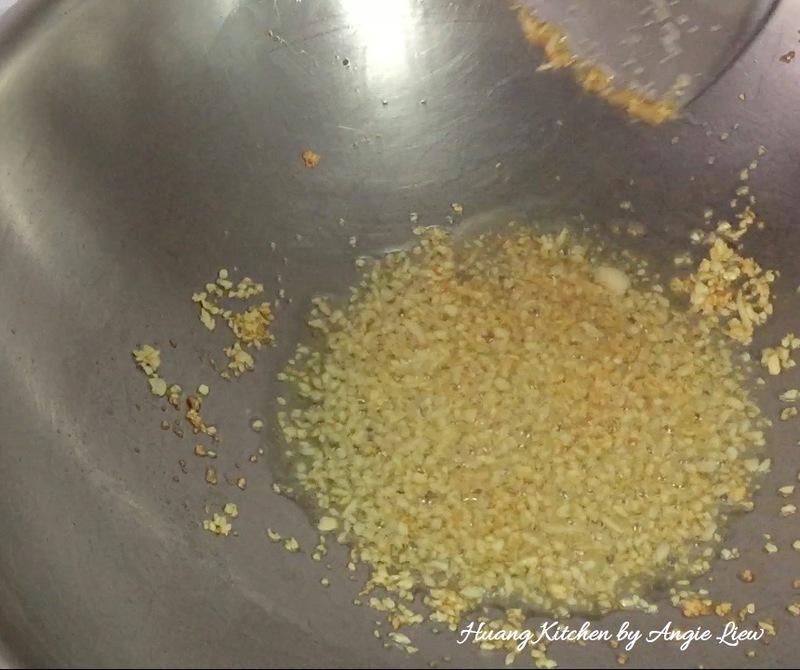 Set aside the fried garlic and oil in a bowl. 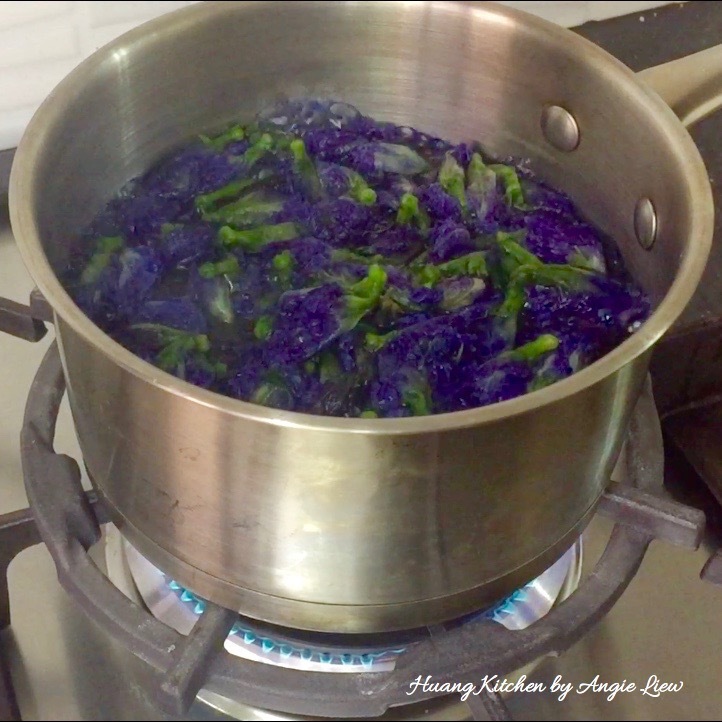 next, place blue pea flowers and water into a pot and bring to a boil. Leave aside for 20 minutes. Using a strainer, remove flowers from the blue colour water and let it cool. 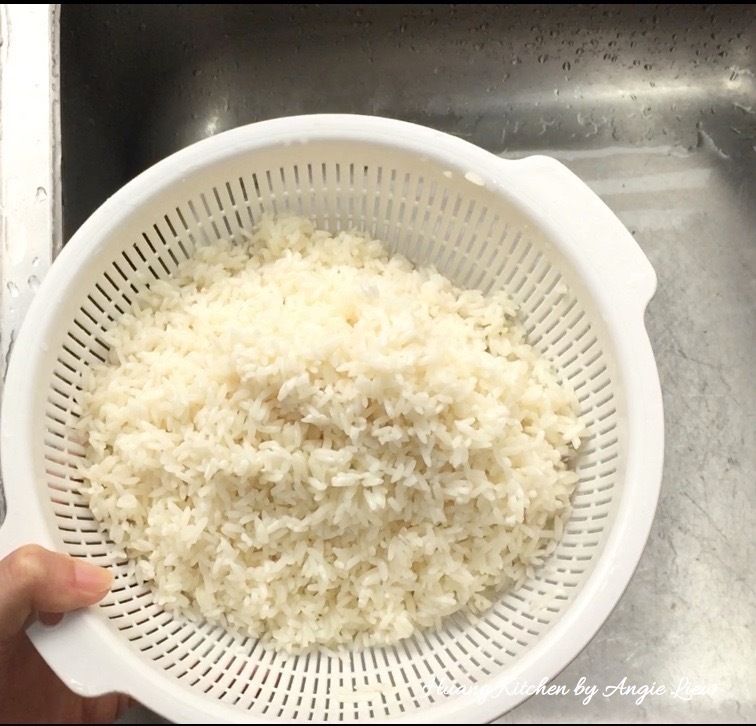 Then, wash glutinous rice until water runs clear and drain well. Divide into 2 equal portions. 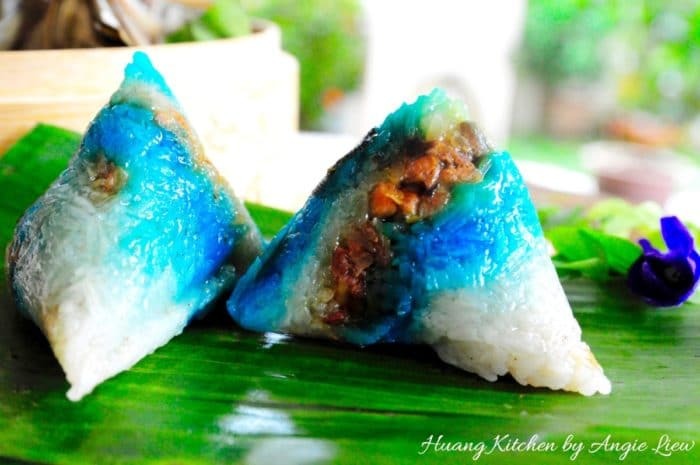 Soak half portion of the glutinous rice in the blue pea water. 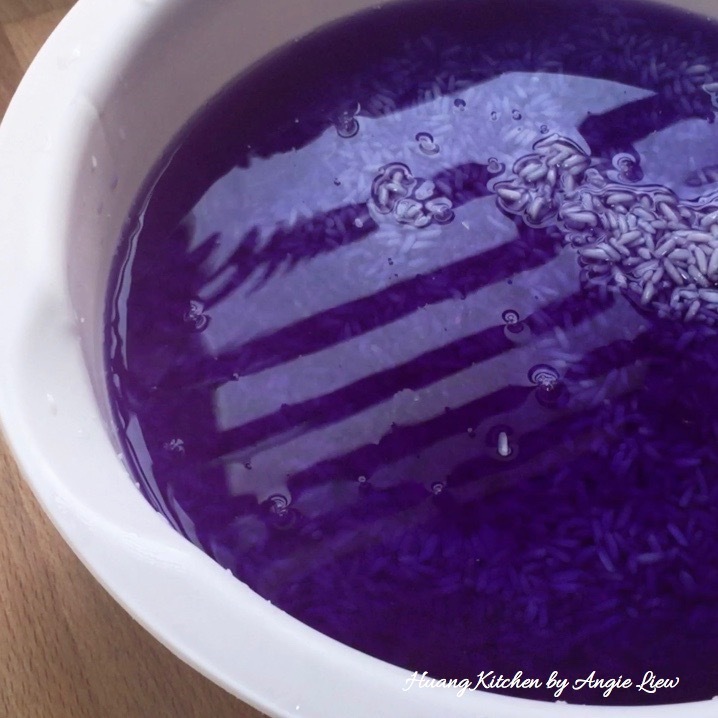 Add vinegar to enhance the colour and more water to ensure the rice is fully submerged and soak for an hour. Then, drain well and then season with salt, ground white pepper, fried garlic and oil prepared earlier. Then set aside. 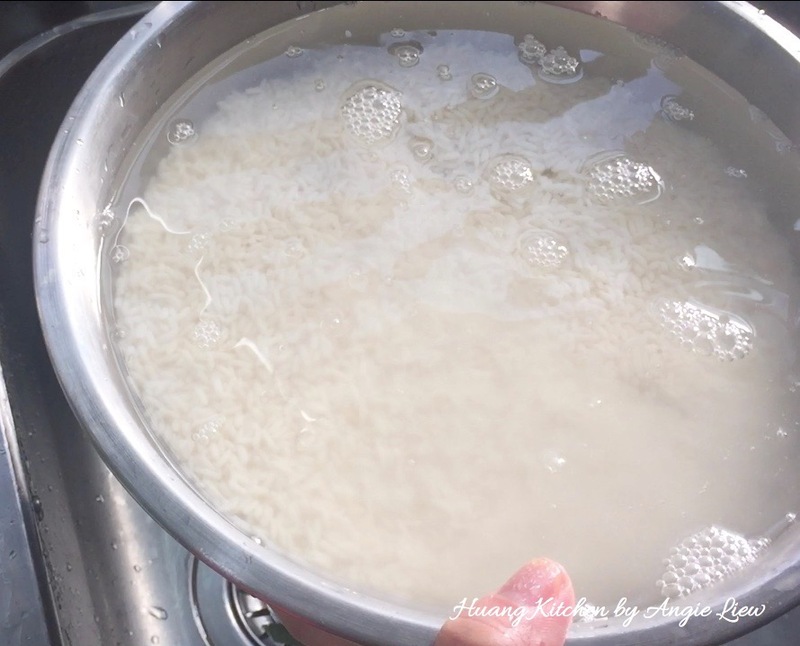 Soak the other portion of the white glutinous rice in water for an hour. Drain well and season with salt, ground white pepper and fried garlic oil. Set aside for use later. And we are ready to prepare the filling! 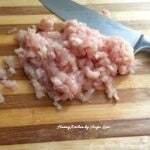 First, cut chicken meat into little cubes. 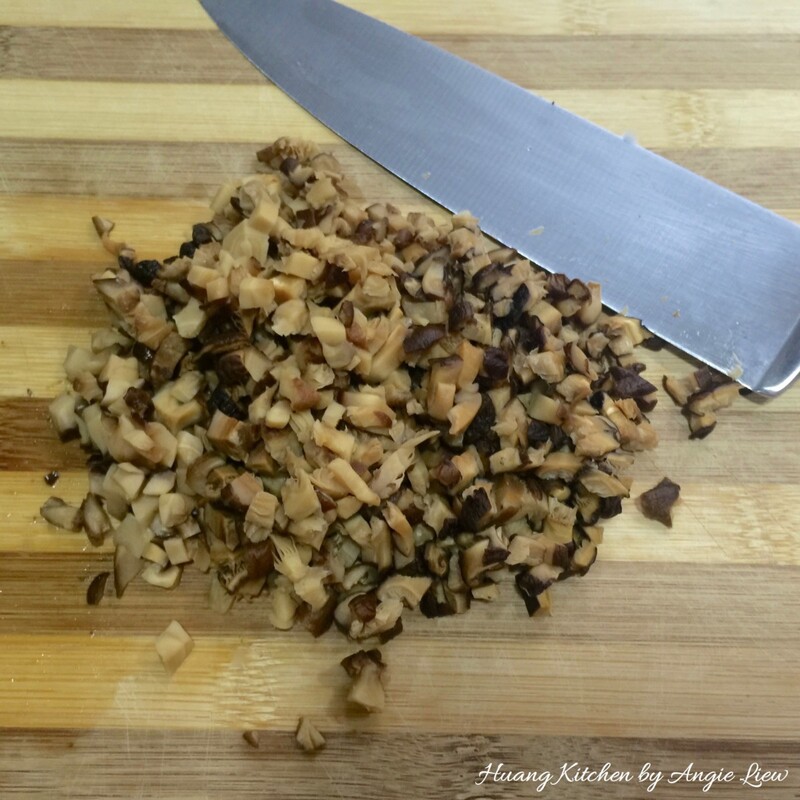 Soak mushrooms and chop into small pieces. Dice candied winter melon into small cubes. Coarsely chop salted egg yolk into small pieces. Wash, drain well and cut screw pine leaves into 2 inch strips and set aside. Next, boil chestnuts in a small pot for about 20 minutes or till soft. 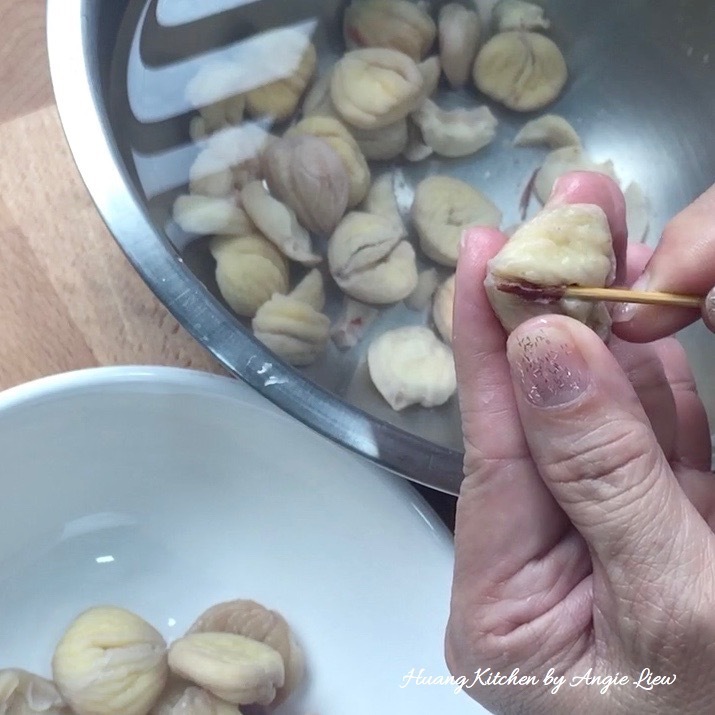 Drain and discard the skin of chestnuts. Chop coarsely the chestnuts and set aside. 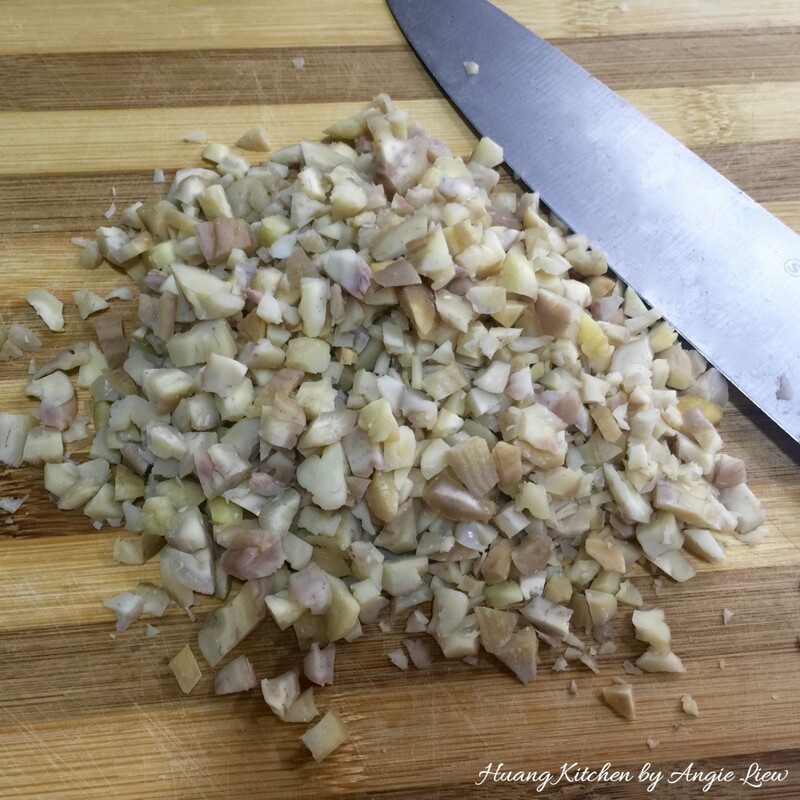 Then blend or chop shallots and garlic. And we're ready to fry the filling! 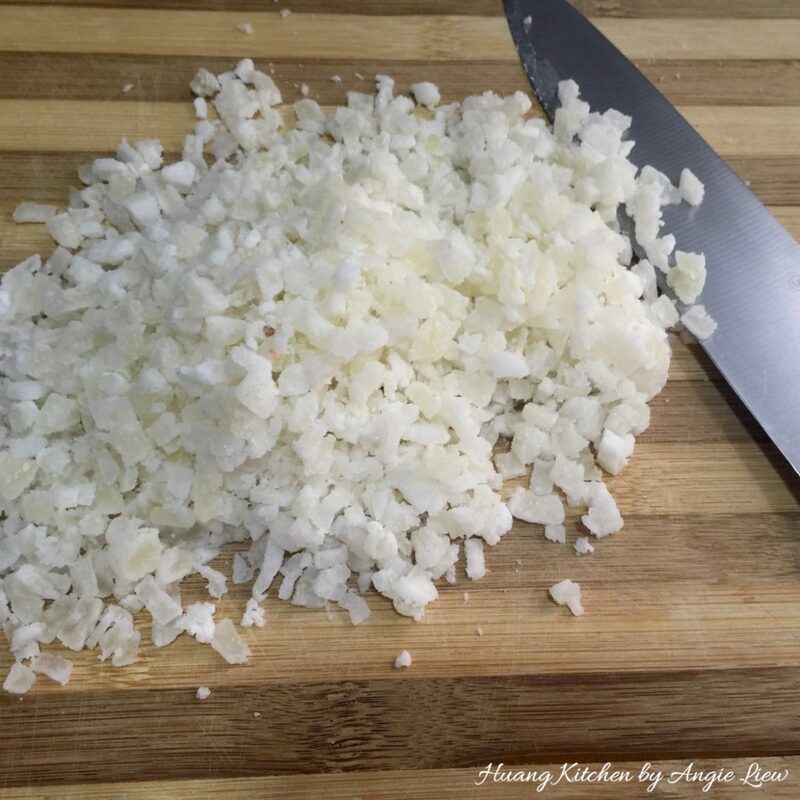 First, saute chopped shallots and garlic till fragrant. Add chicken cubes and fry till meat is cooked. 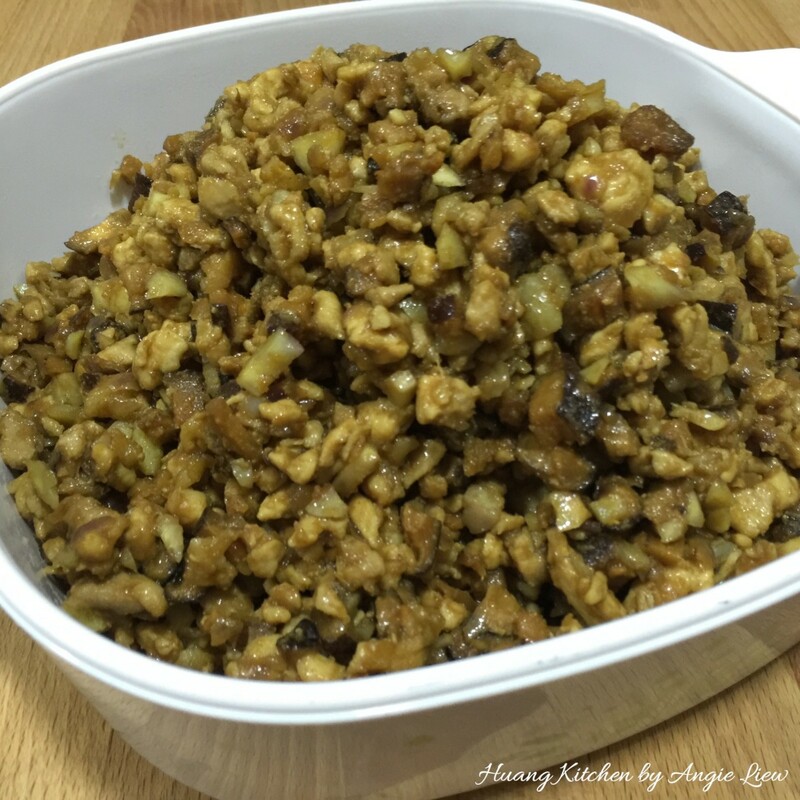 Add chopped chestnuts and mushrooms. 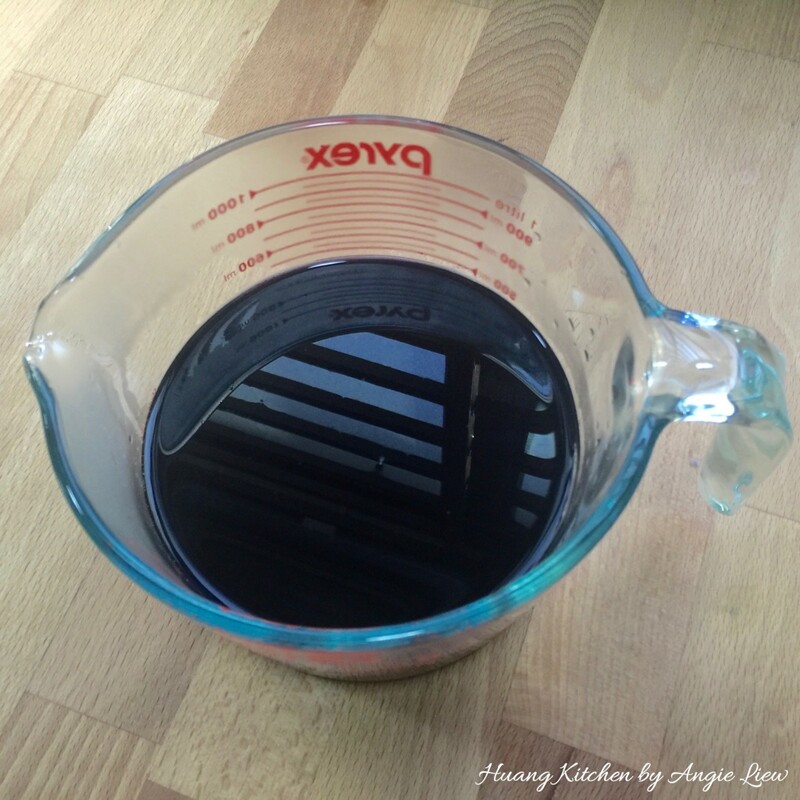 Next stir in coriander powder, fermented beanpaste, oyster sauce, dark soy sauce, sugar, salt and ground white pepper. Stir fry to ensure everything is combined well. Remove from wok and set aside to cool and we're ready to wrap the dumplings. First overlap two bamboo leaves and fold into a cone, without leaving an opening at the bottom. 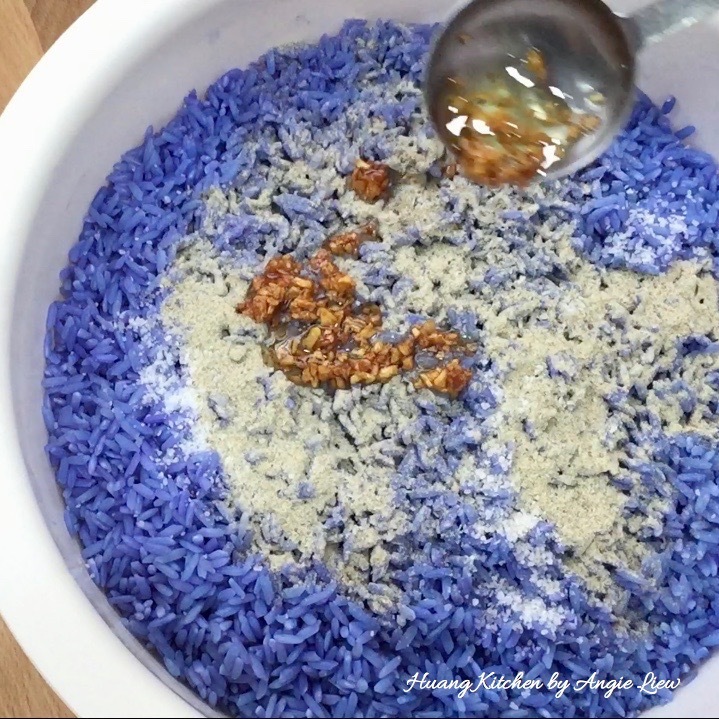 Scoop 1 tablespoon each of first white glutinous rice and then followed by blue colour glutinous rice. 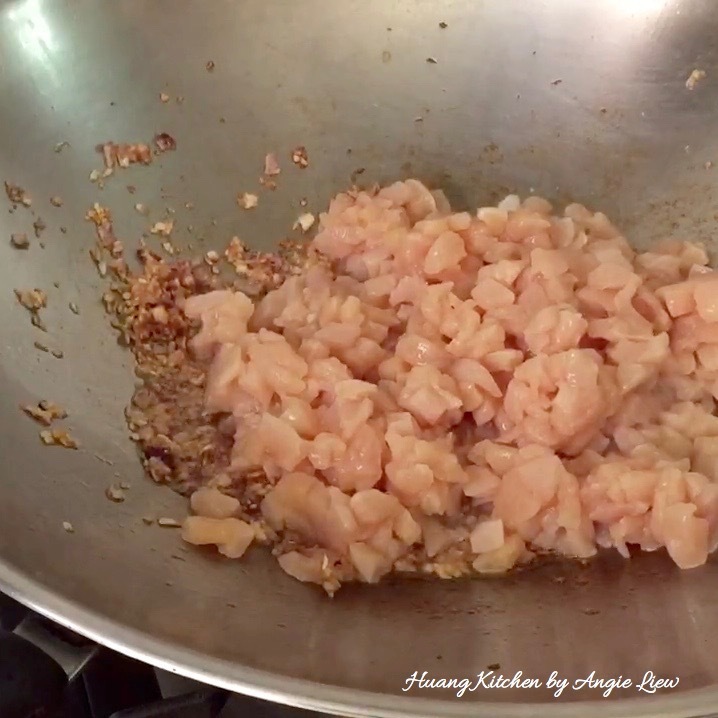 Add in one tablespoon chicken meat filling, a piece of salted egg yolk and a teaspoon of chopped candied winter melon. 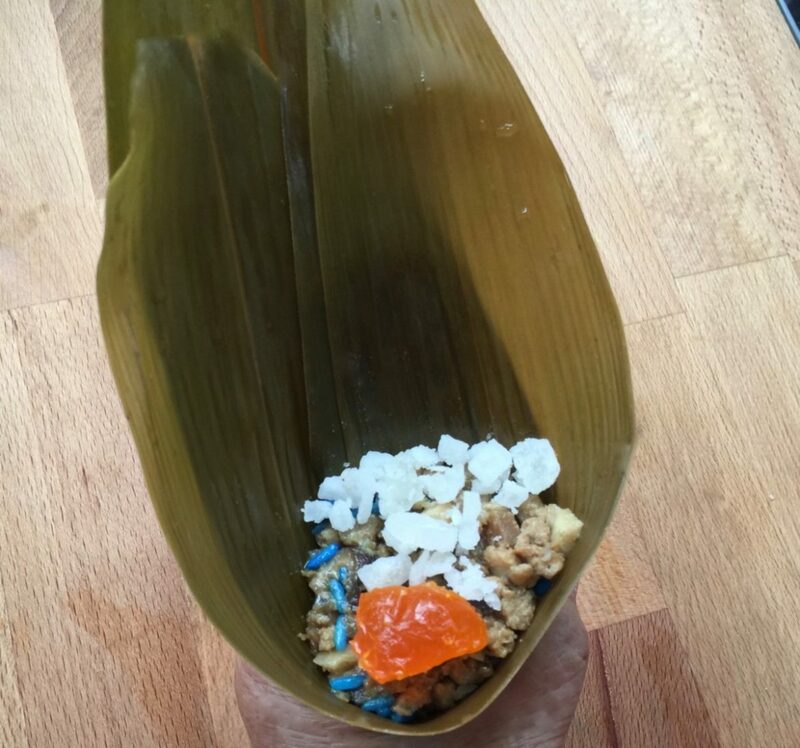 Top with another tablespoon of white glutinous rice followed by 1 tablespoon of blue colour glutinous rice and finally a piece of cut screw pine leave. 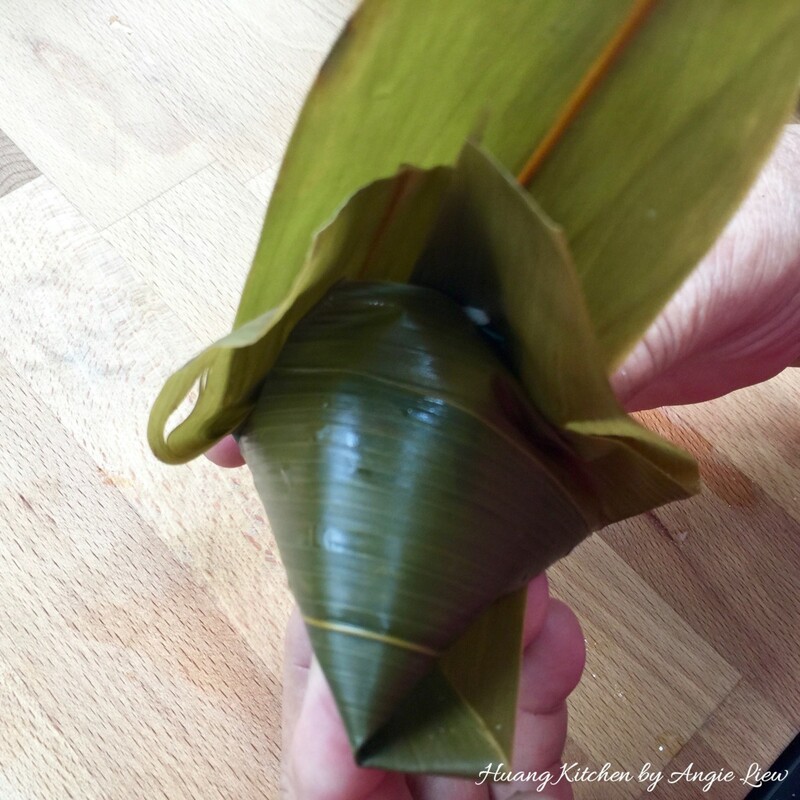 Then fold the longer side of the leaf as a lid to cover the rice. Make sure you press the tip of the dumpling so that the end is pointed. 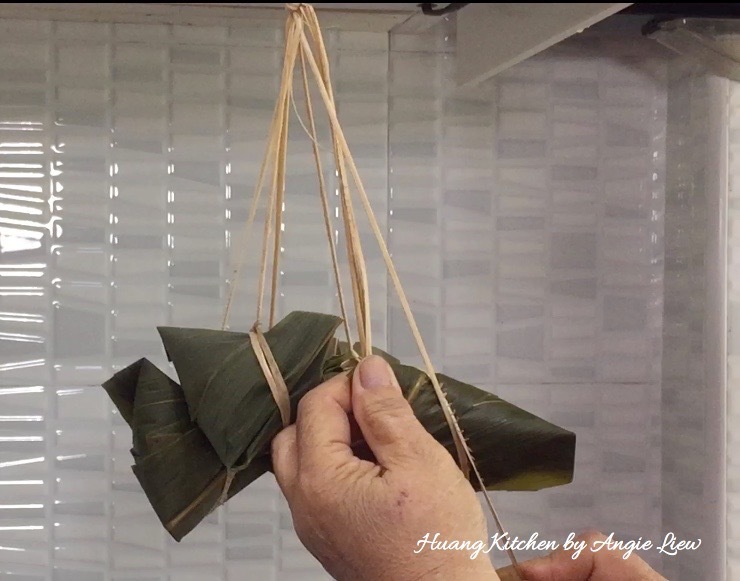 Close the sides of the leaves over the dumpling and fold the ends down to seal. Wind the grass strand firmly around the dumpling twice and then seat with 2 easy knots. Cut of excess bamboo leaf and grass strands. 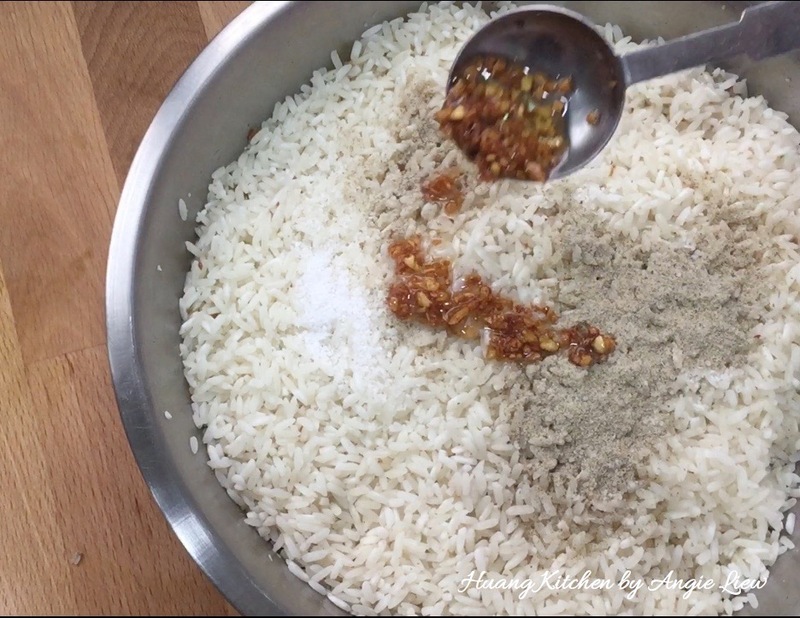 Continue the process for the rest of the rice dumplings. And we're ready to cook the dumplings. First, bring water to a boil in a large pot. Add in some knotted screw pines leaves to enhance the fragrance. Boil the dumplings over medium heat for 1 1/2 to 2 hours or until the dumplings are cooked through. Remove the dumplings from pot once done. Hang to cool and drip dry before serving. 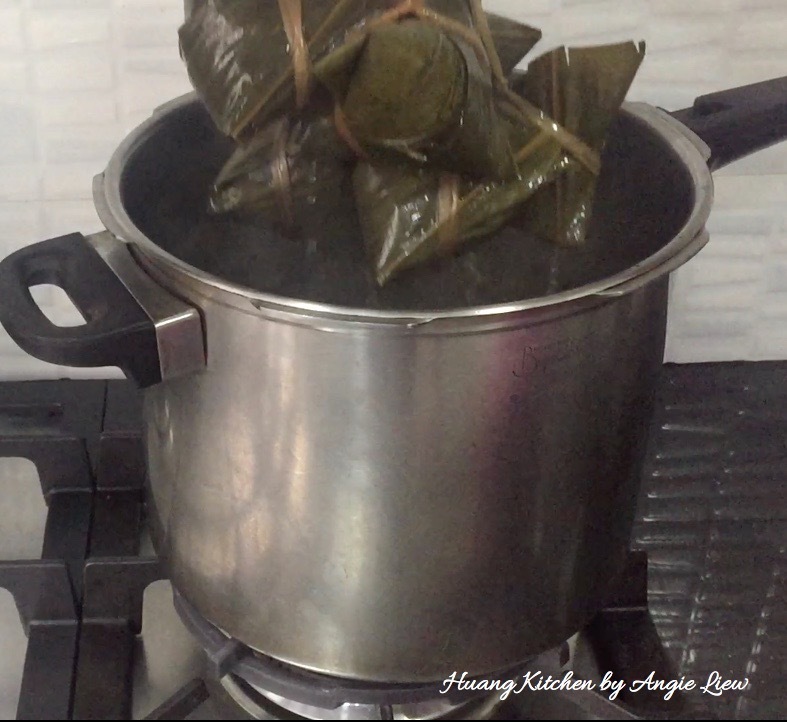 To check if the dumplings are cooked through, always unwrap one dumplings from the pot and taste to make sure the glutinous rice is thoroughly cooked. And we're done! 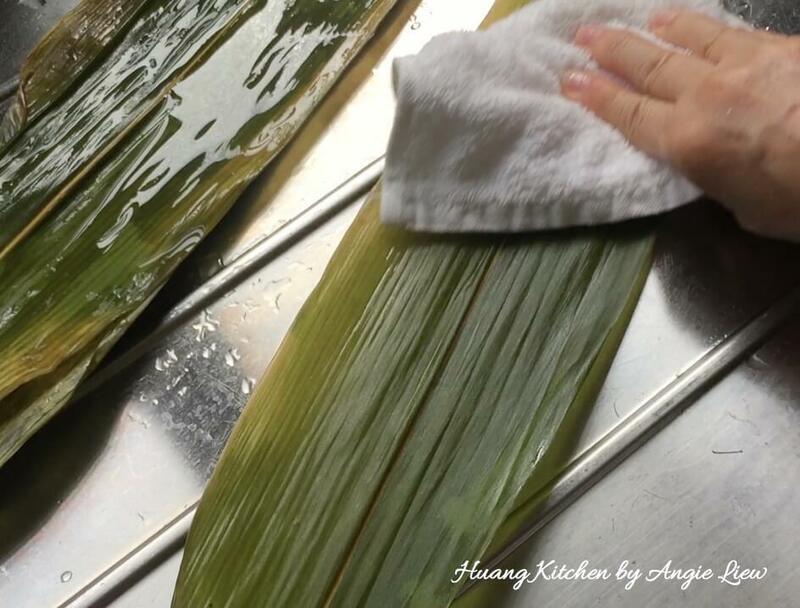 It is advisable to wash and soak the dried bamboo leaves one day before wrapping the dumplings. 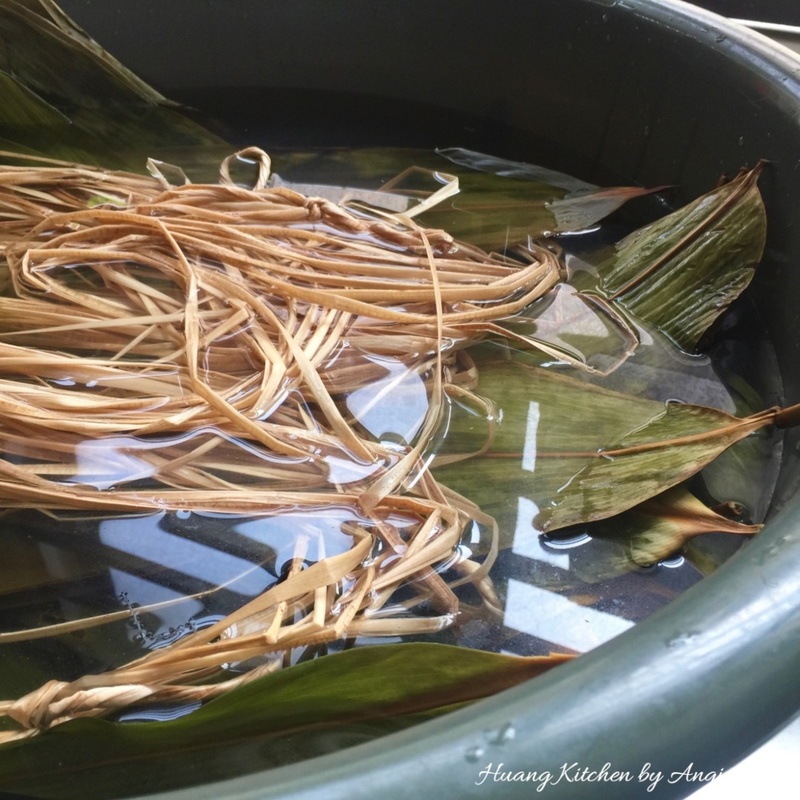 Keep the unused bamboo leaves submerged in water whilst wrapping as the leaves dry up when out of water. Dumplings can't be wrapped too tight or the dumplings will expand as it cooks. 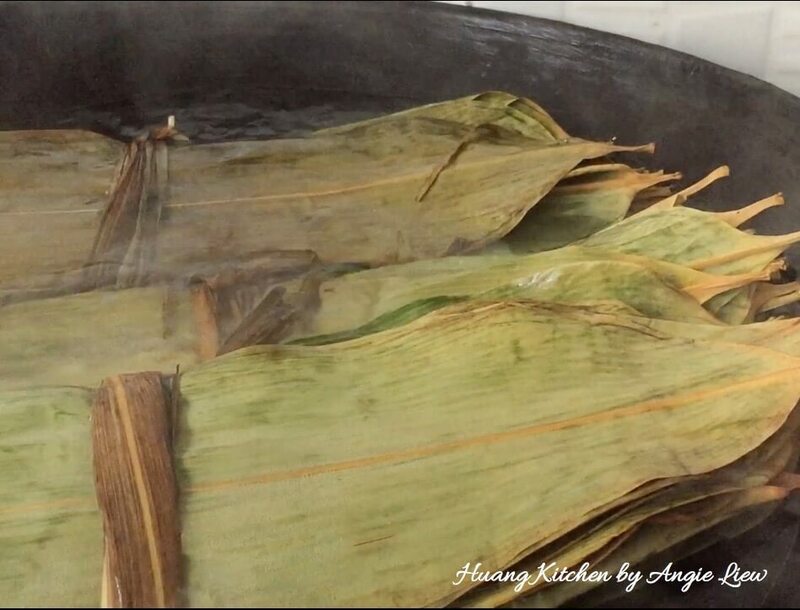 However, the dumplings can't be wrapped too loosely or the glutinous rice and filling may spill out of the bamboo leaves. 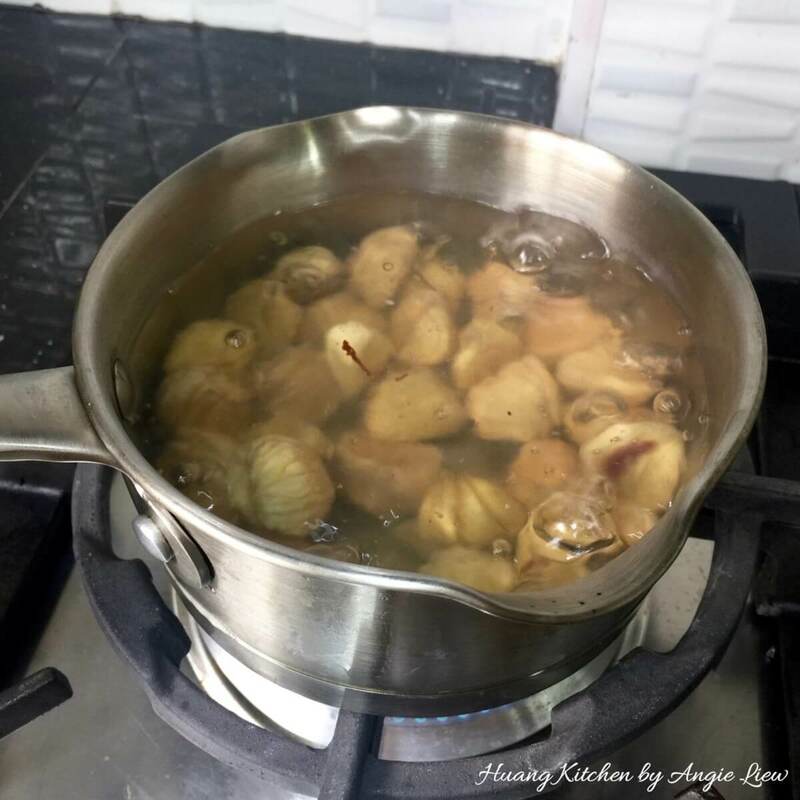 Cooking the dumplings involve boiling the dumplings in a large pot of water or you can use a pressure cooker which can cut down the cooking time. Lower the dumplings into a pot of boiling water. Add screw pines leaves, cover and boil for 2 hours. Remove and hang to air dry before serving. Bring water in pressure cooker to a boil (do not cover). Add in screw pine leaves, lower dumplings,cover and cook over high heat till pressurised. Then lower heat and continue to cook for another 20 minutes. Next, turn of heat and leave dumplings in pressure cooker for another 15 minutes. De-pressurise the pot and remove dumplings to air-dry before serving. These dumplings can be refrigerated or frozen until needed. Just steam them (without thawing) for at least 20 minutes before serving.